Jam filled cookies with centers filling of jam drops. 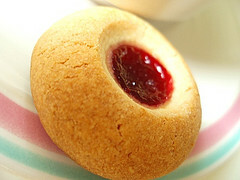 These jam cookies are delicious and simple to make. Add eggs and vanilla essence to mixture and beat well. Add flour gradually and mix into smooth dough. Form into 32 small balls. Make a hole in the centre of each ball, fill with a little jam and seal up. Place cookies on greased baking trays. See Customer Reviews and Compare Bakeware sets . Bake in a preheated oven at 350°F for 15-20 mins. Serve hot.